Complexity in Simplicity. That’s a good way to describe the musical we saw last night: The Last Five Years (L5Y) by Jason Robert Brown (FB). Now L5Y would not be at the top of the list of musicals we would see this week if we could (42nd Street Moon’s The Most Happy Fella would have that spot). After all, we’ve seen it twice before: in 2006 at the Pasadena Playhouse, and in 2007 at the 81 seat REP East Playhouse. However, our daughter specifically asked to see it, and so off to the Geary Theatre we went. This did provide us with the opportunity to see the show in a large venue — Pasadena is mid-size, and REP was intimate. The Last Five Years is a simple show in terms of story: there are two actors, and they rarely appear together. The show tells the story of the relationship between Jamie and Kathy. Kathy’s version of the relationship story is told backwards: from the breakup to when they meet. Jamie version is forward: from when they meet to the breakup. They are only together at the middle (the marriage) and the last scene (but that time their songs are separate). The story alternates between the two stories, and from it the audience gets the story. Given this structure, the storytelling depends on two things: the performance and the music. Jason Robert Brown (FB)’s music has the JRB romantic musical sound (i.e., you’ll find that The Bridges of Madison County has a similar sound): deep, lush, emotive, and at times playful. There are some very beautiful songs in L5Y; there are some very funny songs; and there are some very poignant songs. More than almost any other show I know, this show is a showcase for the actors and the directors. Good actors can make the show. Wooden actors can put you to sleep. I’m pleased to say that the performances at A.C.T. were wonderful — they were full of personality and character. When these actors were happy, you know it; when they were sad, it was clear. You could get a real sense of their personalities from their performances. For example, just look at Zak Resnick (FB)’s performance in “Shiksa Goddess”. It was playful, happy, bouncy, and full of character. Similarly, the emotion he brought out for “The Schmuel Song” was spectacular. He was paired with Margo Seibert (FB)’s Kathy. Again, this was a performance filled with personality, as demonstrated in both “A Summer in Ohio” and “I Can Do Better Than That”. Both were just a lot of fun to watch. Kudos to the director, Michael Berresse (FB), for keeping the production simple and for bringing out the personalities of the characters. Jeffrey Brian Adams and Kelsey Venter were the understudies. The six piece orchestra was under the music direction of Matt Castle (FB), who also played the piano. Accompanying him were Deborah Price on violin; Jessica Ivry (FB) on cello; Kelley Maulbetsch (FB) on cello; Schuyler McFadden (FB) on guitar; Dewayne Pate (FB) on bass. Kevin Porter (FB) was the music contractor. Tim Mackabee (FB)’s scenic design of the production was simple. Some large scrims created walls that could move, and there were various establishing furniture pieces and props that would move on stage to indicate the particular scenic location. This was complemented by the excellent lighting design of Robert Wierzel (FB), who used the lighting not only to establish mood but to punctuate songs and emotions. Kai Harada (FB)’s sound design was clear and crisp up in the mezzanine, which is something that can be difficult in a large theatre. Remaining production credits: Associate Lighting Designer – Paul Hackenmueller (FB); Costume Design – Callie Floor (FB); Casting – Janet Foster C.S.A. (FB); Stage Manager – Megan Q. Sada (FB); Assistance Stage Manager – Christina Larson. A.C.T. San Francisco is under the artistic direction of Carey Perloff (FB). 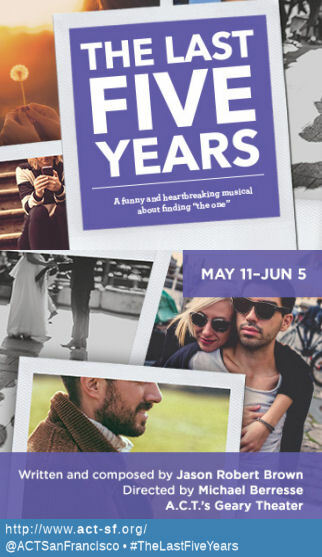 The Last Five Years continues at the American Conservatory Theatre (ACT) of San Francisco (FB) until June 5, 2016. Tickets are available through A.C.T. online. Discount tickets might be available through Goldstar or Theatre Bay Area. A.C.T. San Francisco has announced their 2017 season, and one show caught my eye: Here Lies Love, running in June 2017. This is a musical by David Byrne, with music by David Byrne and Fatboy Slim, about Imelda Marcos. I’ve heard the music, and it is quite fun. I recommend it to those in the Bay Area. Upcoming Shows: Next weekend brings Los Angeles: Now and Then (FB), a new musical at LA City College (FB) from Bruce Kimmel. The last weekend of May has HOLDs for the MoTAS Outing to the Jethawks, and for I Only Have Eyes for You at the Ricardo Montalbán Theatre (FB). Whew. July brings us back to conventional theatre, with Beautiful at the Hollywood Pantages (FB) and the Western Corps Connection (FB) the first weekend, a HOLD for Grey Gardens at the Ahmanson Theatre (FB); the second weekend, The Little Mermaid at Cabrillo Music Theatre (FB); the third weekend, Weird Al Yankovic at the Hollywood Bowl (FB) and Operaworks (FB) Opera Re-Constructed at CSUN; the fourth weekend, a mid-week Hollywood Bowl (FB) concert of Wynton Marsalis and Aaron Copeland, and a HOLD for Armadillo Necktie at The Group Rep (FB) the last weekend. As always, I’m keeping my eyes open for interesting productions mentioned on sites such as Bitter-Lemons, and Musicals in LA, as well as productions I see on Goldstar, LA Stage Tix, Plays411 or that are sent to me by publicists or the venues themselves.